One of the NHL’s top checking lines could be without a key piece for the upcoming weekend. 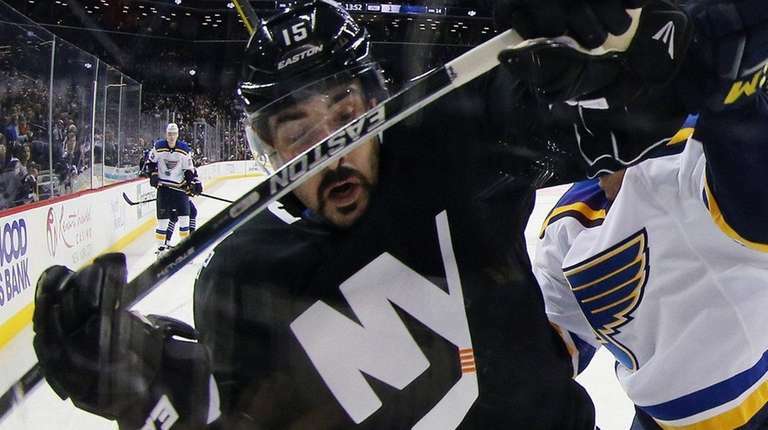 Cal Clutterbuck participated in Friday’s practice, albeit as an extra. Steve Bernier took his place on the fourth line alongside Matt Martin and Casey Cizikas. “I’m going to get some treatment this afternoon and tonight and we’ll see how I respond to that in the morning,” he said. The Islanders play in Columbus against the Blue Jackets on Saturday night and at home against the Devils on Sunday. That back-to-back begins a string of six games in 10 days, and coach Jack Capuano doesn’t want to rush the right wing back. Losing Clutterbuck long term would be a huge loss for the Isles’ penalty kill, which has been successful 85.4 percent of the time (fourth-best in the NHL). Clutterbuck’s physical play and checking would be missed, too. He also has been scoring this season; he has six goals, one fewer than all of last season. But Capuano believes he has the personnel to fill in for Clutterbuck. Eric Boulton, a physical force who had been on injured reserve with a lower-body injury, could be an option. Adding Bernier to the line could alter the unit’s chemistry, which Clutterbuck credits as the reason for success on penalty kills. Bernier doesn’t have the same chemistry with Martin or Cizikas that Clutterbuck has established, but the first-year Islander showed in practice Friday morning that he can work well with his new linemates.